Dexter Marques engages is back presses as he winds down training sessions. (GBBC) were forced to conform to this anomaly and effect changes to the boxing card slated for February 27 at the Giftland Office Max Mall, Liliendaal ECD. International Boxing Federation (IBF) Inter-Continental Bantamweight champion, Elton ‘The Bully’ Dharry, was scheduled to face off with Panamanian boxer, Israel Hidrogo, in a 10 rounds bantamweight duel but reports are that the Panamanian pugilist would be unable to keep his ring date. They say good tidings can lurk behind bad news and this view was effectively endorsed after the organizers were able to fill the void with another lucrative proposition. As such, Guyanese boxing buffs will see an ex-world champion, Venezuelan, Felix Machado, who has replaced Hidrogo, battling Dharry in a ten rounds non-title bantamweight scrap. This much was relayed to Kaieteur Sport Friday afternoon by referee Eon Jardine. Mr. Jardine said that Hidrogo’s misfortune had forced officials to readjust and they immediately contacted Machado’s management team and were able to seal the deal. Both Dharry and Machado are expected in the country on February 23 to keep their ring date. Machado commenced his career in August 1993 with a lopsided victory over his countryman, Elvis Montoya and won the Venezuelan bantamweight title on points against Jesus Rattia within a year after stripping his shirt. He added the WBC FECARBOX super flyweight title to his collection in August 1995 after outpointing another of his countrymen, Fernando Blanco. The Venezuela added the WBA Fedelatin super flyweight title to his collection in April 1996 after forcing the referee to call a halt to his bout with Alcibel Flores in the 6th round. That win improved his world rankings and it was not long before he faced off with Vicente Rivera for the WBA World bantamweight title which he won after forcing the third man to call a halt in the 5th stanza. Things went a bit awry for Machado and he suffered a few losses that culminated with a loss to Giovanni Caro in November 2010 before Machado decided to take a sabbatical. A rejuvenated Machado returned to his winning ways in February 2015 with a decisive majority win over Jose Larreal and would be keen to maintain the momentum against Dharry. To date, he has chalked up 305 rounds in 40 bouts from which he won 26 (12 by KO) after losing 13 times (4 by KO) and earning one draw. His knockout ratio stands at 30%. Meanwhile, as the local boxers continue their preparations for their respective bouts, former CABOFE Bantamweight champion, Dexter Marques, scheduled to do battle with Venezuelan, Freddy Baleno in a 10 rounds flyweight fight, has intensified his training at the Andrew ‘Sixheads’ Lewis Boxing Gym (ALBG). On Friday afternoon, Marques took a break from sparring and engaged in mostly speed work, a rigorous session on the jump rope and calisthenics. He is rounding off nicely and continues to voice confidence of winning his bout. When Kaieteur Sport visited the Harpy Eagles Boxing Gym her opponent, Ansila Norville, had already wrapped up sessions and left, while her coach, James ‘Sack’ Walcott had taken his charges for road work and was unavailable for comment. 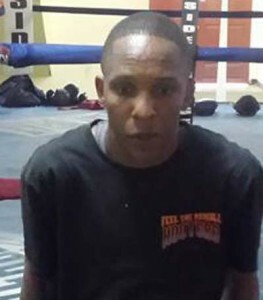 In the other preliminary bout, Barbados based Guyanese pugilist, Revlon Lake, will get an opportunity to avenge an earlier loss to Barbadian, Miguel Antoine when they clash over 10 rounds in the welterweight division while Imran Khan has promised to perform his ‘Magic’ against Quincy Gomes in their 6 rounds lightweight duel. Barbados based Guyanese pugilist, Revlon Lake, will oppose Barbadian, Miguel Antoine when they clash over 10 rounds in the welterweight division. Three amateur bouts will complement the card and Nankumar Singh will clash with Jason Phillips while Dennis Thomas and Desmond Amsterdam will duke in out over three rounds in an exhibition match while what has been regarded as a grudge match. Delon Charles and Clairmonte Gibson will round off the amateur segment. Admission is $5000 for a ringside seat while general seating costs $2000.